The Symbol Mattress "Dortmund Double-Sided Luxury Firm" is a fantastic choice for anyone who is in the market for a firmer mattress - that still has body-contouring effects - that is cost-efficient. 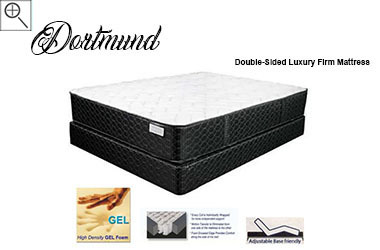 Sometimes with pocket coil mattresses durability can be a concern but with the Dortmund this won't be a worry. High density foams and a flippable design combine to give you long-lasting comfort. As an added plus, this model features a white organic cotton cover. This model is made in the USA and it's composed of CertiPUR-US foams. Its manufacturer is very dedicated to progressive mattress design; always adding the most current and sensible features to all of its models. New for 2018, the Dortmund looks to be a mattress that ends up being one of our best sellers. This is an improvement on a previous design that was already a great mattress value. The "Dortmund Double-Sided Luxury Firm" is a great, cost-efficient double-sided (you can flip it!) mattress by Symbol that is available in both standard and custom sizes. A "luxury firm" is going to be a firm and supportive sleep surface that still conforms to your body while you lie on your side - due to its individually wrapped pocket coil system. Air Flow Foam helps to dissipate your body heat as you sleep. Foam encased edges decrease motion transfer and provide stability to the mattress. The specifications that this mattress offers would result in a much higher retail cost, if this model were made by a "bigger name" manufacturer. Well, with the Symbol Dortmund, you're getting all of the great features, comfort, and longevity; with the lower price tag.